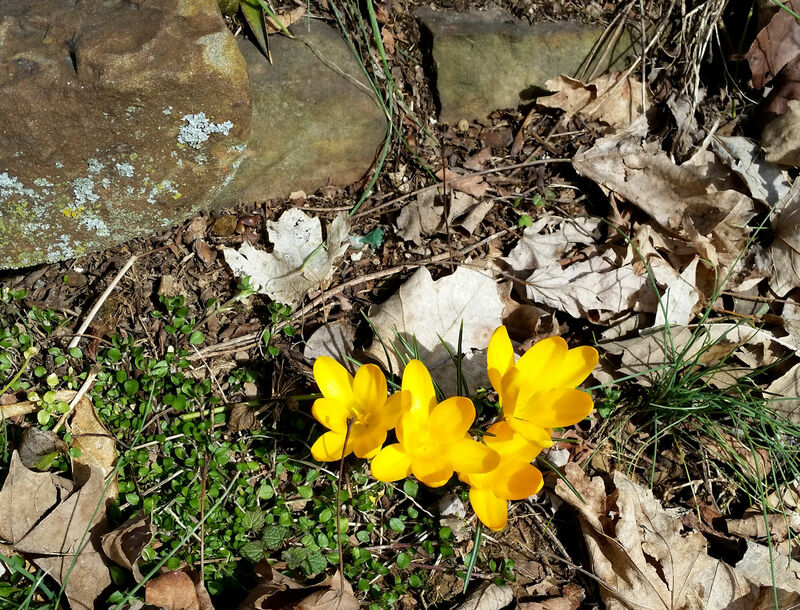 These cheery yellow crocuses are the first to bloom this year. They get extra warmth and shelter near this rock wall. After what seems like weeks of rain, wind and generally yucky weather (yes, that is an actual meteorological description in the Midwest), we finally had a beautiful sunny and relatively warm day with temps in the 50s. I couldn’t wait to get outside for a bit. This is the time of year to clean up all the winter debris. I know I raked those flower beds so where did all these leaves come from? This is just a small portion of the area still covered by the chestnut seed hulls. I raked four wheelbarrow loads today and have as much again to rake tomorrow. They didn’t decompose much over the winter. A big mess in the yard was our last chestnut which we cut down a week ago. We had already cut down two companions previously. The Chinese chestnut is a beautifully shaped tree with an umbrella-shaped top, large leaves, beautiful grayish bark and, of course, lots of chestnuts. These trees were very prolific. 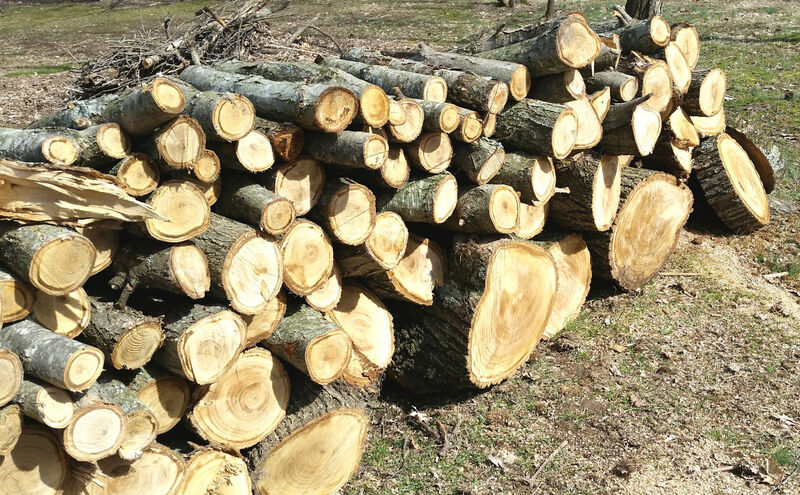 This would not normally be a problem as we have plenty of room – ninety acres, remember – and we have loads of other nut-bearing trees. Oaks, walnuts, hickory, plus fruit trees. Chestnut seed hulls remind me of spiny sea urchins. They are very painful to handle or step on. I only use leather gloves to work with them. 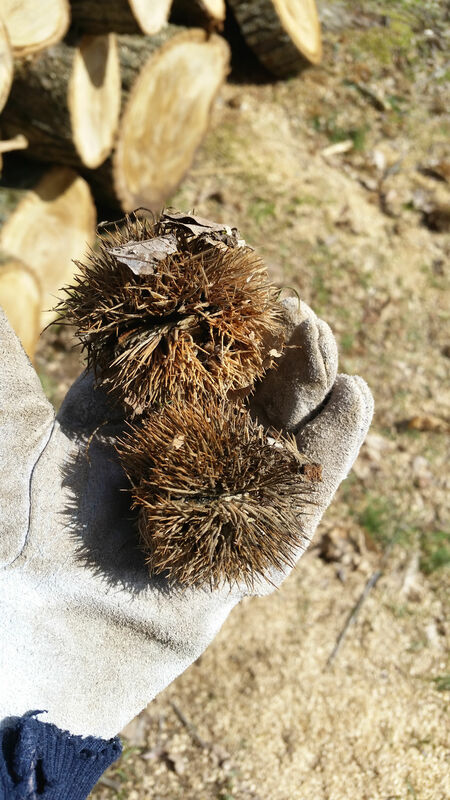 However, chestnuts have a seed hull which is very prickly, like a spiny sea urchin. You can only handle them with leather gloves and they are very painful to step on. They are also very prolific. When we cut down the first two chestnuts, we thought that we wouldn’t get any more seed pods without the pollinators. That was a mistaken idea. As you can see by the debris on the ground, there was still plenty to clean up. I spent a couple of hours raking and gathered four wheelbarrow loads of hulls. There is still as much again to do tomorrow. 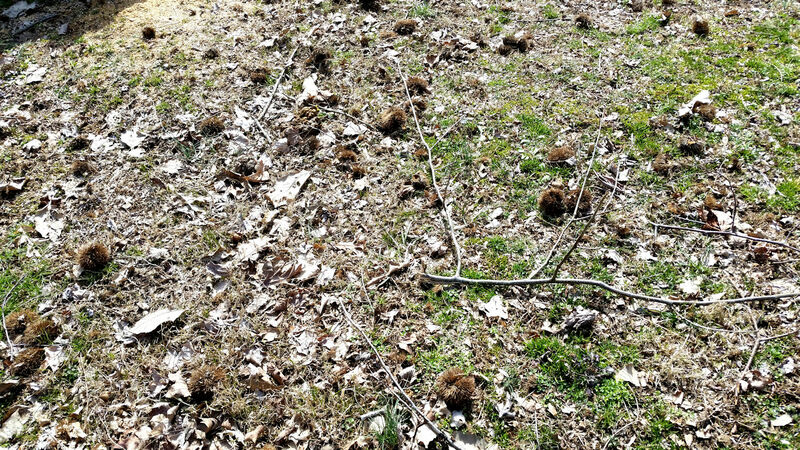 What I couldn’t rake will eventually decompose but it will probably be a few years before anyone can go barefoot in that part of the yard. Chestnut woodpile. 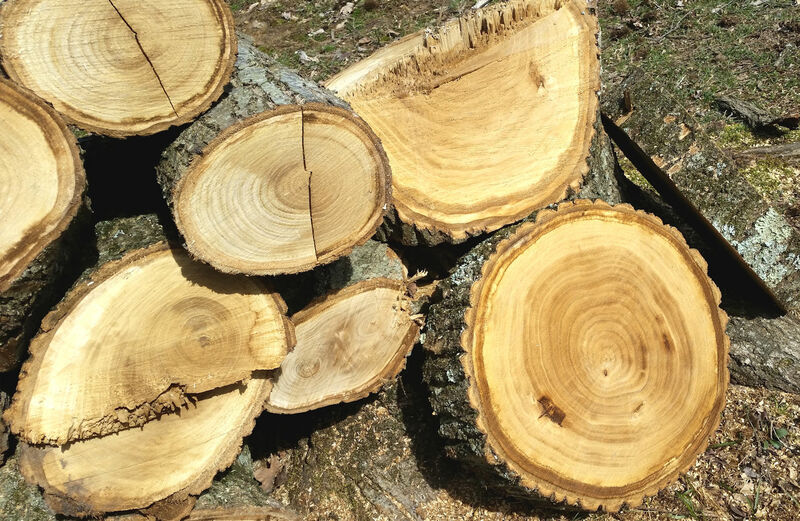 All of this wood came from one tree. Chestnut wood is beautiful with a grayish-green color and kind of stripey. It is also very dense and heavy. It was a beautiful day. The first crocuses were finally brave enough to pop out. I even spotted a few spring beauties in bloom. In about a month, they will carpet the lawn so it looks like snow. One of my favorite wildflowers and early harbinger of spring. 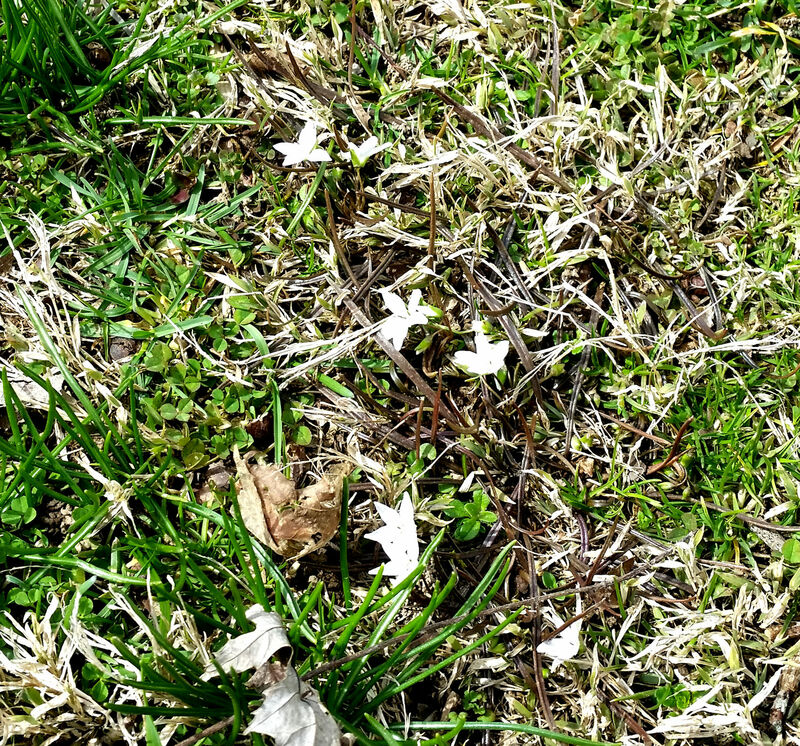 Spring beauties have a delicate pink stripe which can’t be seen in this photo. I’ll try for another shot later. I sure was ready for lunch and a rest. And our dog Mikey was ready, too. Keeping me company and following me around was hard work. You are like a chestnut burr, prickly outside, but silky-soft within, and a sweet kernel, if one can only get at it. Love will make you show your heart someday, and then the rough burr will fall off. I had the idea for this painting rolling around in my head for some time. 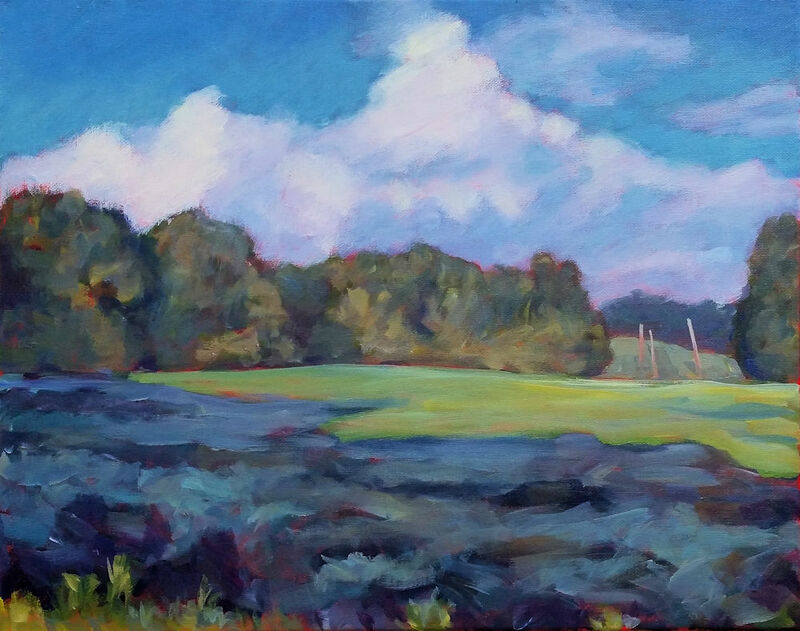 The middle of the day is not my favorite time to paint as the shadows are often small and the colors are too washed out. However, I wanted to try this back-lit village scene with the street, buildings and cars. There weren’t really any people around at the time that I took the reference photos for this painting which is surprising considering all the cars that were there. I decided to add some people to the landscape to give it more life. The challenge for a painting like this is, first, to get the perspective correct. Perspective can be conveyed not only from the actual drawing but distance is also indicated by the shading. The farther away the objects, the lighter the shading. The second challenge is to ensure that the colors are right, that enough details are included without being too focused on details. It’s all a matter of balance. 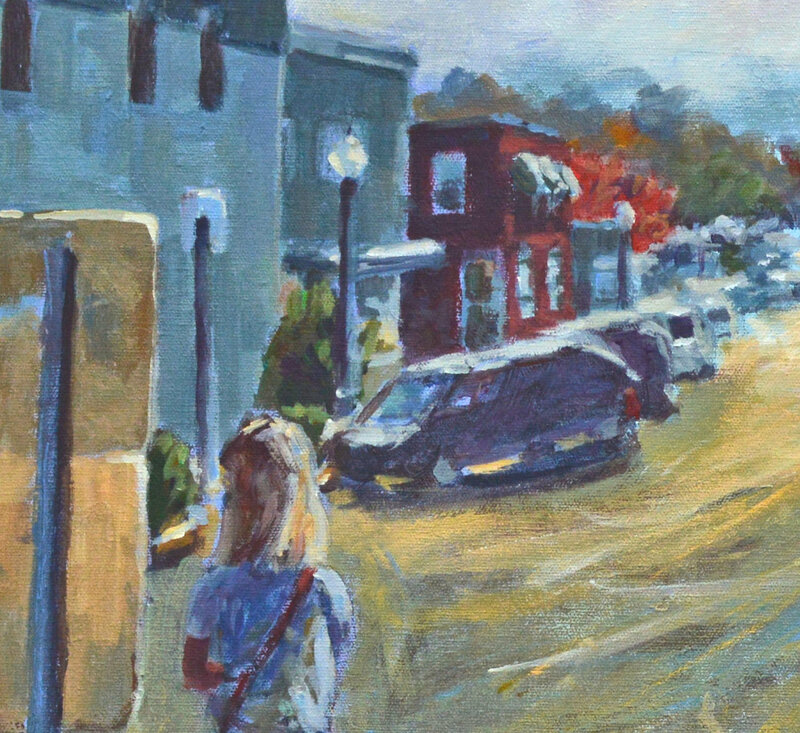 High Noon, detail 2. Adding people to a street scene makes it come alive but you don’t need to include every detail. Let the viewer’s eye fill in the story. 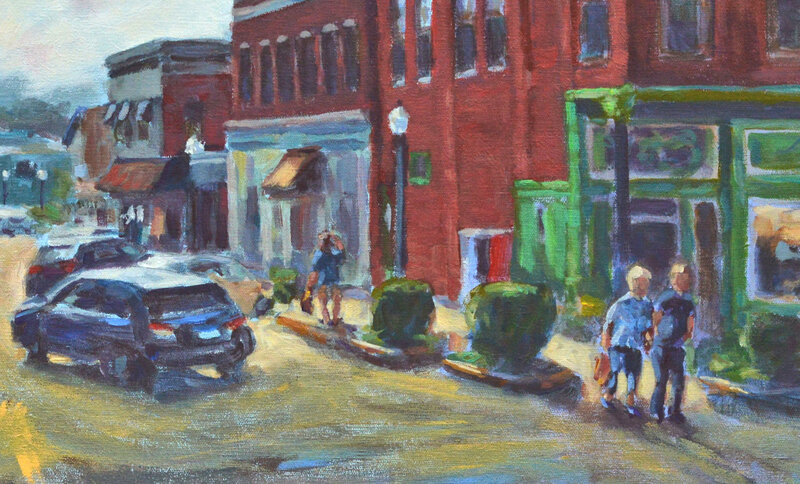 I added more color to the street to “lay it down”, that is, to make sure it didn’t appear floating. 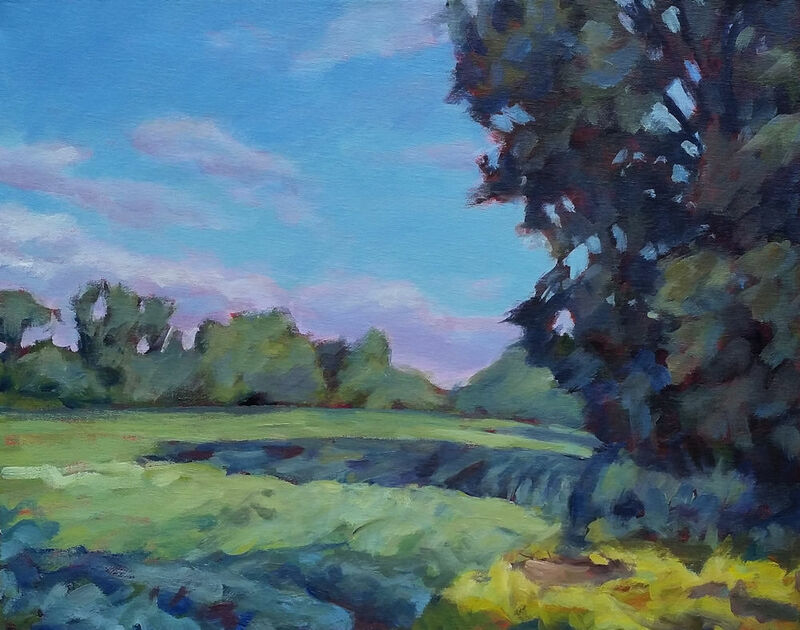 This is where having a lot of experience in plein air painting helps. Photos often make the darks too dark and the lights too light. Copying a photo exactly often gives unsatisfying results. Overall, I liked the challenge of this painting. 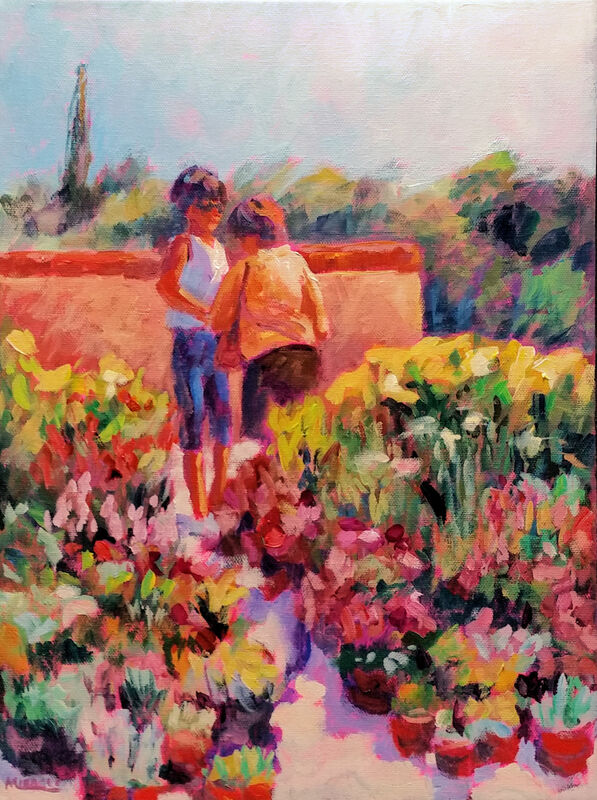 It has been on display at a local gallery and many people have recognized the scene and commented on it. I love to drive around on the roads in this part of the country. Especially this time of year, the trees are golden and a multitude of other colors. Just looking at the scenery makes my heart sing. This is a little one lane bridge in my county. My son commented the other day that it’s amazing that up close, impressionistic painting looks just like a bunch of fuzzy blobs, but step back a few feet, and the whole scene looks realistic and inviting. I couldn’t agree more. It’s all an optical illusion. 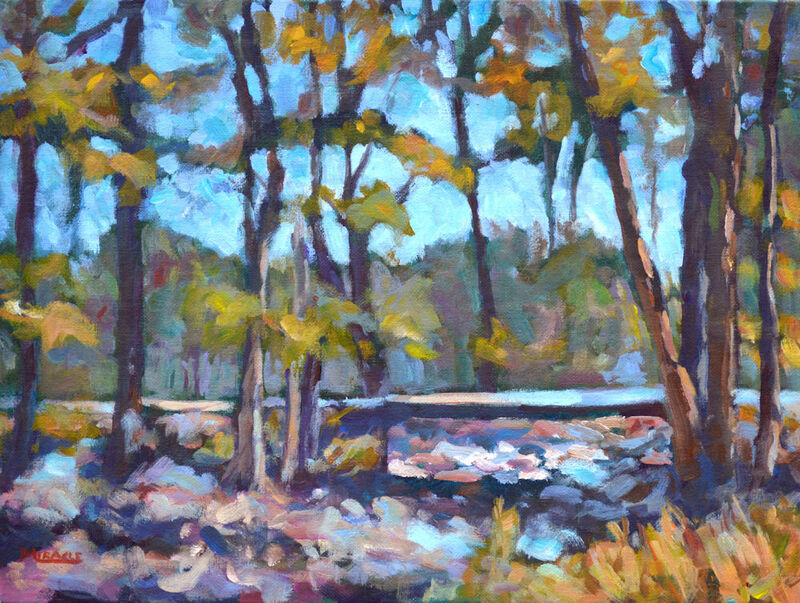 Yesterday I drove up to Indianapolis to drop off a couple of paintings at the Indiana Plein Art Painters Association annual member exhibit. I haven’t entered this before, mostly because of the three hour drive. But the day was a beautiful fall day, starting off with some fog in low-lying areas. The fall colors were breathtaking. For those of you who think Indiana is represented by flat cornfields, nothing could be further from the truth. The southern part consists of beautiful hills, rivers, and streams covered mostly by deciduous forests. This time of year, the landscape is a panorama of golds and reds. It was just a glorious day for a drive. 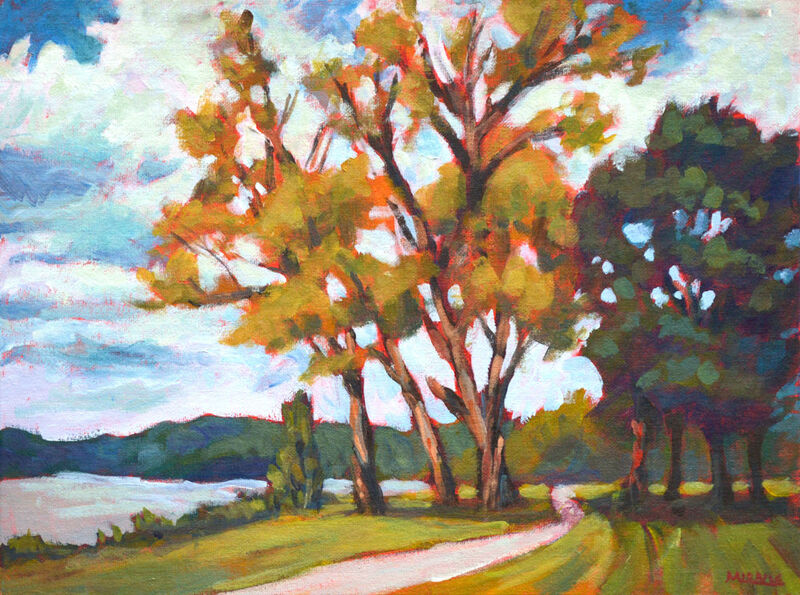 One of the two paintings I entered is Trees at Alton, Indiana, on the Ohio River. I just painted this back in late September. As you can see, the tall trees on the left are just beginning to show some color. Alton is a tiny little collection of houses and has been flooded many times over the years. But the people who live here are passionate about living on the Ohio River so they always come back. There is something mesmerizing about the big river with its barges and other river traffic. I can just sit and watch the river for hours. This scene is pretty classic. Just some trees, a path leading into the picture, a river and some hills. A very peaceful vista. If you’re interested in seeing the whole exhibit, it is at the Hoosier Salon Gallery in Carmel, just north of Indianapolis. The exhibit runs from November 10th through December 14th. The reception is Saturday,, November 10th 5-9 pm. 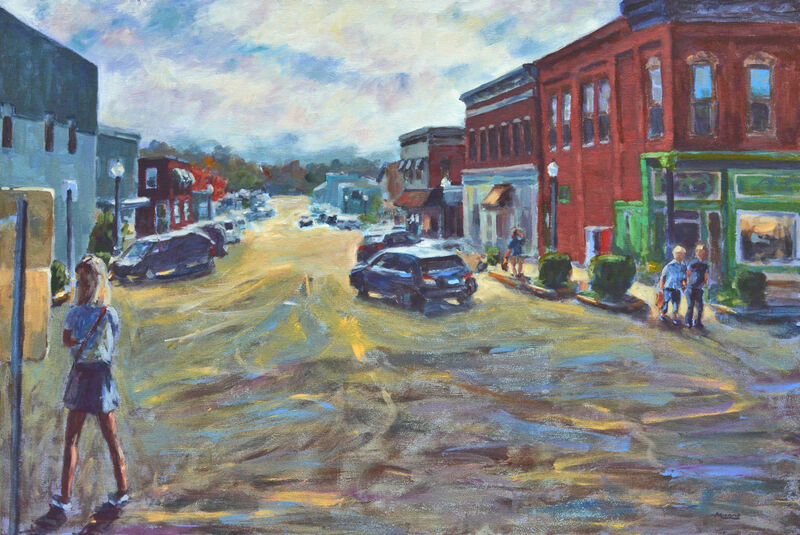 There are many beautiful paintings of all parts of Indiana and most of the work is for sale. Take a gander at this exhibit and visit lovely downtown Carmel with its many arty and eclectic shops and eateries. A great time for some holiday shopping. 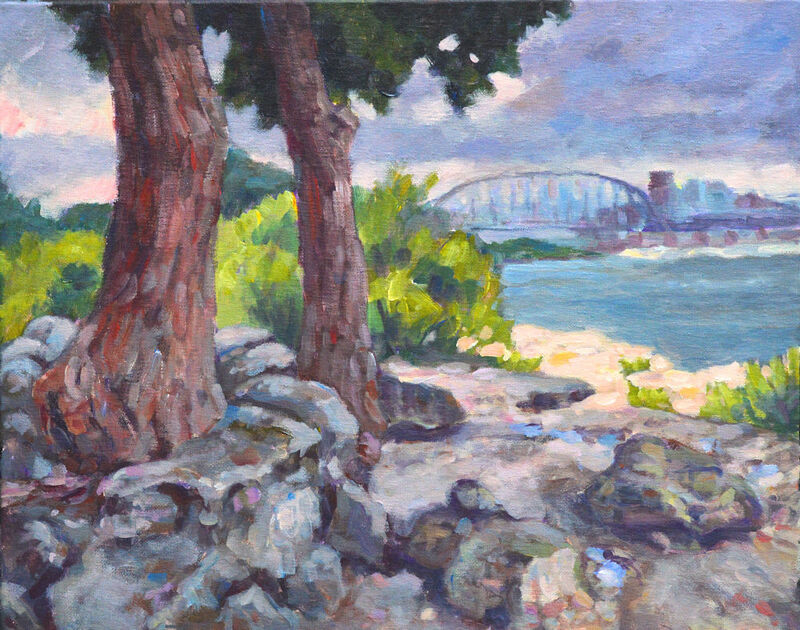 Falls of the Ohio II, acrylic on canvas, 16 x 20, Kit Miracle. This view is looking back towards the shore from the beds, where the puddles reflect the cloudy sky and trees. A couple of weeks ago my husband and I took a day trip to the Falls of the Ohio in New Albany, Indiana. Although it’s only a short drive away, I had never been there. The Falls of the Ohio is an Indiana state park set on the edge of the Ohio River. It features large fossil beds which visitors can climb over. You can view thousands of fossils right beneath your feet. As the level of the river drops, more layers of fossils are uncovered. Falls of the Ohio I, acrylic on canvas, 16 x 20, Kit Miracle. View from the treeline at the Falls, across the river towards Louisville. We saw a train crossing the bridge while we were there. The day we visited was an in and out day, with showers alternating with sun. I particularly loved the setting along the river. The old trees, the puddles reflecting the trees, the skyline of Louisville across the river. We even saw a train crossing the old bridge. There is an interpretive center which has a fee but the visit to the Falls is free. If you go there, it is a bit tricky to find but follow the signs. Obviously it’s on the river so you will be looking for River Road. Take a picnic lunch or travel along River Road to eat lunch at one of the many neat restaurants in the area. You can even follow the road east to Jeffersonville to the walking bridge over the Ohio. All in all, an enjoyable day. It’s good to try something new. This week I created a set of paintings but I’m not quite sure what to call them. They are of our east field in the evening, showing the stretching shadows. I started with one painting, the one on the far right, and that just lead to another and another and another. Four in all…so far. I’m actually working on a fifth one. Since these are all painted from the same vantage point, it’s not quite a series which I consider to be more of the same subject but not necessarily from the same view. This set of paintings creates one broad vista, each overlapping by a quarter to a third. They don’t exactly match as far as horizon and it wasn’t my intention to do so. But I did want to convey the same feel. 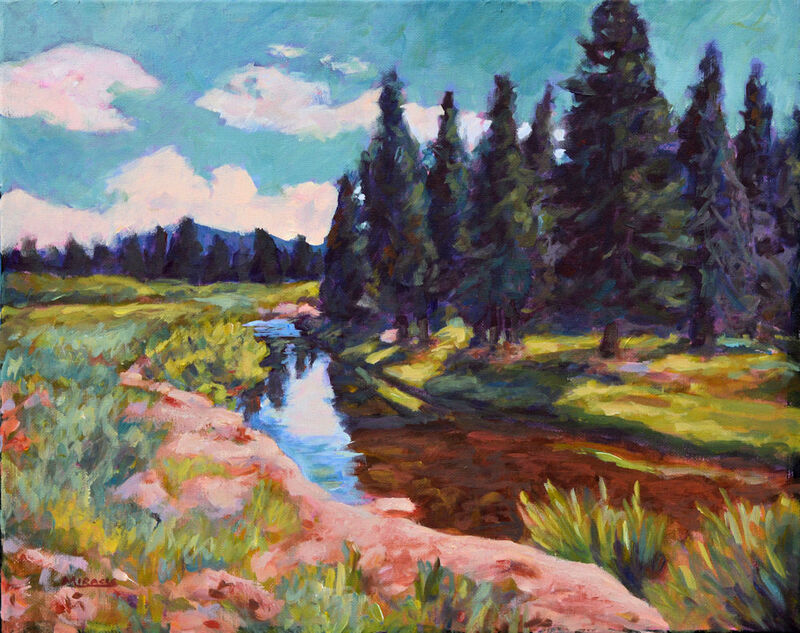 Although they work well together as a connected work of art, the individual paintings each stands alone as far as composition and technique. My question is, what does one call four (soon to be five) paintings of the same larger subject but from the same vantage point? If a diptych is two paintings, and a triptych is three, what is four or five? The best information I can find is a polyptych or maybe a tetraptych or soon to be a pentaptych. Doesn’t exactly fall off the tongue, does it? If you have never visited the western United States, you really must do so someday. I particularly love Wyoming, Yellowstone and the Grand Tetons. However, when my husband and I visited a few years ago, we took the northern route across the Big Horn mountain range, (a nail-biter for sure). After we crossed the mountains and were heading to Cody for the night, we drove along this river valley. The scenery is just so beautiful. Peaceful and with the bluest sky you’ve ever seen. I imagine it’s a different story in the winter but this was summer. As I searched through old photos earlier this week, this subject caught my eye. Of course, much editing as usual, but the landscape just called to me. Oh, how I want to visit again. This is painted in acrylic on stretched canvas. I’ve painted the edges black so the painting doesn’t necessarily need a frame. Such a peaceful painting. Enjoy! 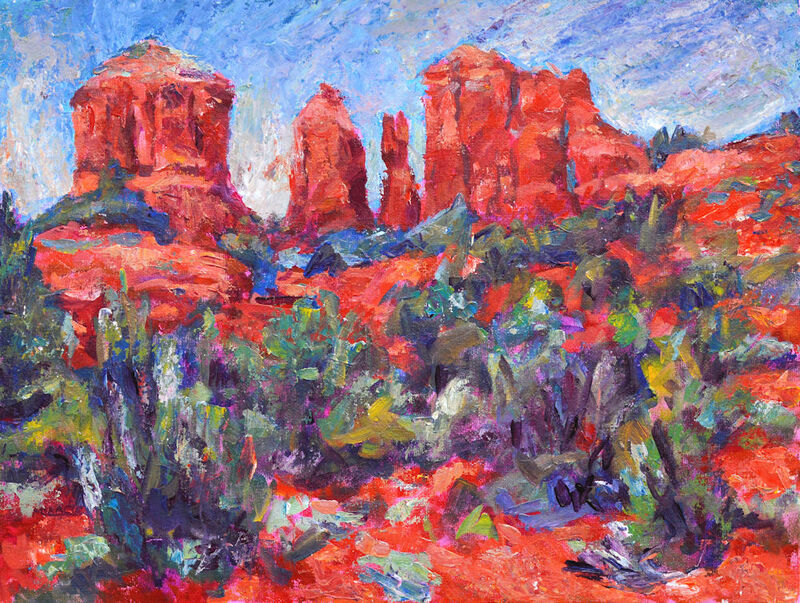 Whether or not you believe in the magic energy of vortexes, any visitor to Sedona, Arizona will immediately be struck with just how beautiful the area is. 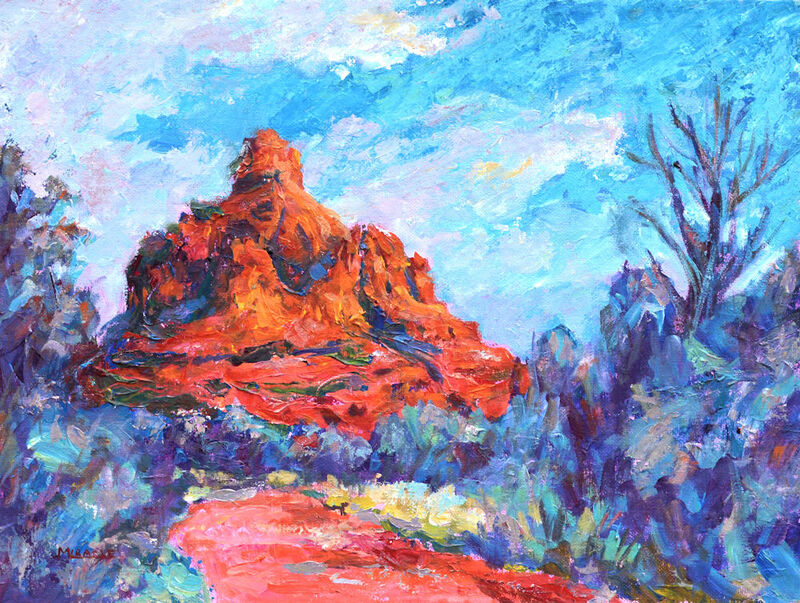 The red rocks with the green juniper trees set against the azure blue skies are just breathtaking. 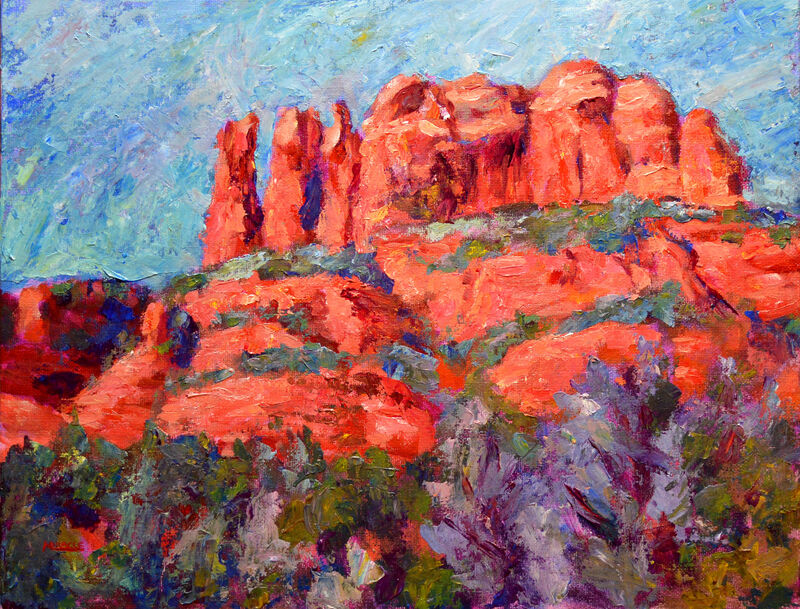 A few years ago I spent time in Sedona doing some plein air painting. I got up early in the morning or went out again in the late afternoon to catch the light I love so much. This past week, I revisited my photos and sketches from the trip and decided to paint some of my favorite areas again. This time, the paintings are a little larger and have some heavy impasto paint to add texture. I just had so much fun recalling the trip and the time and places while I was working. Check out these paintings of two of the four vortex rock paintings. Click on the paintings to see closer views which show the texture of the paint. Of course, they’ll be for sale on my Etsy shop soon. 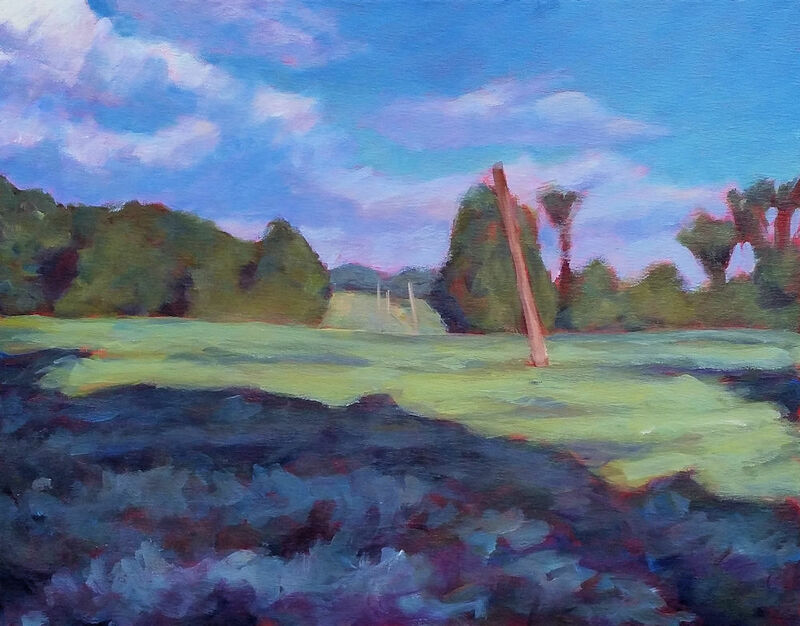 I still need to paint the last two sites in the series, Airport Rock and Boynton. 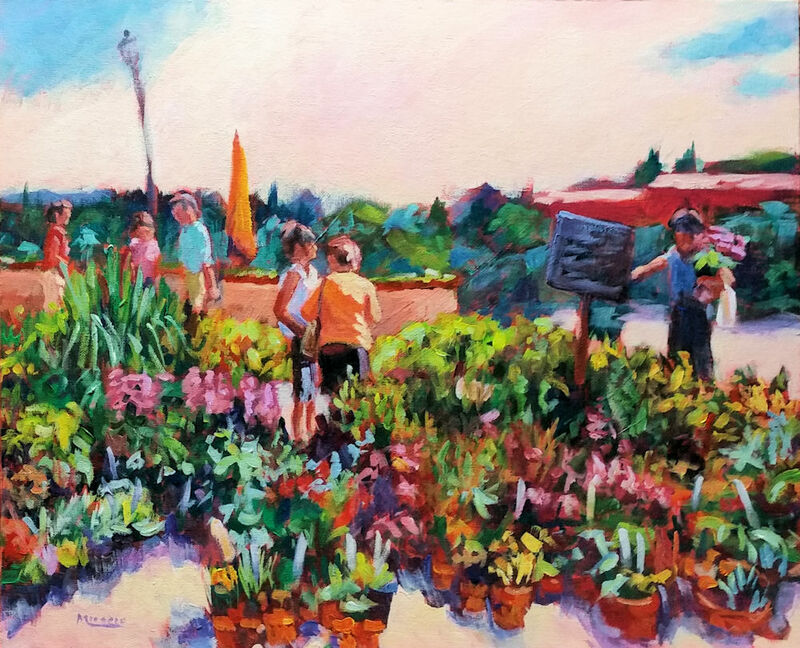 Flower Market, Jardin du Sur, Uzes, Provence, France. 16 x 20 on red-toned canvas panel. Kit Miracle This shows the final painting. I have sharpened some of the details and added more. I deliberately did not concentrate on the white labels for the flower pots as I thought they would be too distracting. Overall, I like the painting but it seems a bit busy. Small Flower Market, Uzes, Provence, France. 16 x 12. Kit Miracle Final painting. I like the way the path leads the eye to the main figures. Plenty of color but it works for the subject. Several years ago I had the opportunity to bike through Provence, France. It was the opportunity of a lifetime. I fell in love with the area. One of our stops was in Uzes at the Jardin du Sur. This was wonderful open air flower market on a very hot Sunday. I spent quite some time there, sketching, taking photos, writing postcards, and, of course, buying a souvenir or two. The flowers and the people were so inspiring. A few weeks ago, I was going through the old photos and my journal when I came across these references to the flower market. I decided to create the larger painting first which is on a red-toned canvas panel. After I was finished with it, it seemed a bit too busy even though I had cut out many details. Then I decided to do another painting of the same scene but just a close-up of the two main figures. This was on a canvas which I had toned fuchsia! Yes, really! I think I like the second canvas better but what do you think? Anyway, if you’d like to see a step-by-step, visit this page where you can follow along on both of the paintings. My husband and I were able to take our first winter vacation in a very long time. 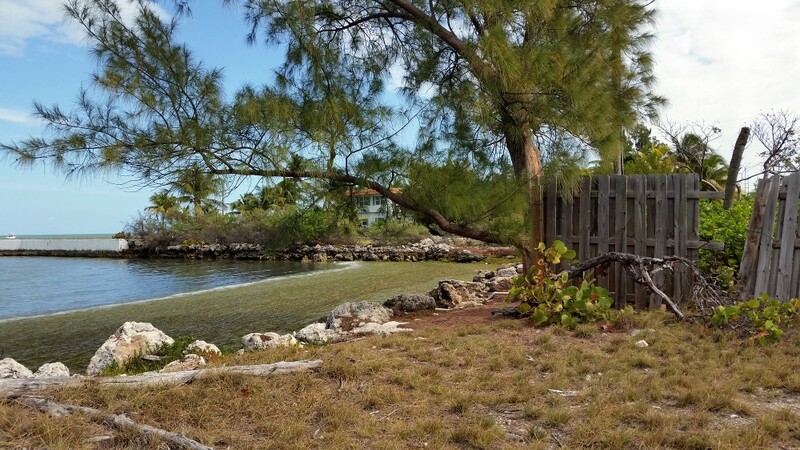 We chose the Florida Keys which we hadn’t visited for over 30 years. Oh, it was so nice to bask in the warmth of the sun. One of the nicest parts about the Keys is that there are so many places that visitors can pull over to fish…or in my case…paint. 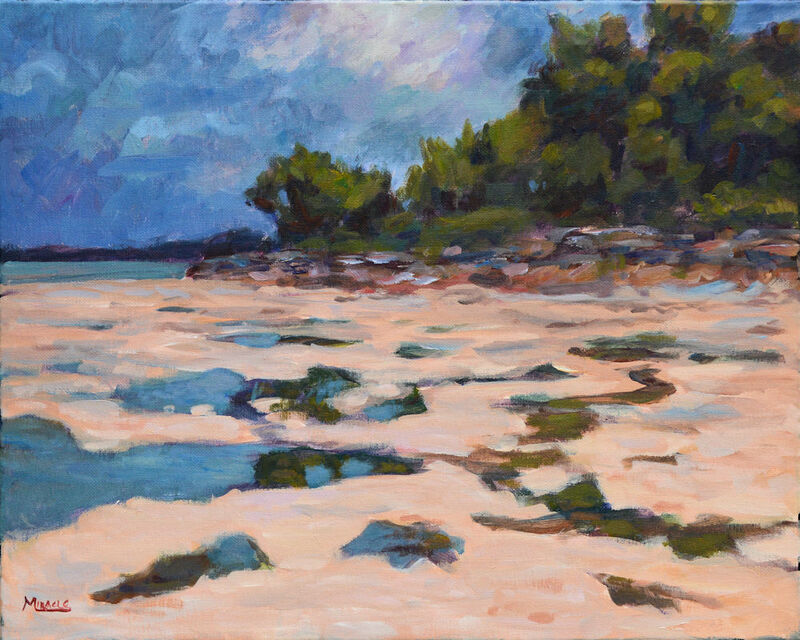 The Pentalic Aqua Journal (5 x 8) is perfect for painting broad landscapes. 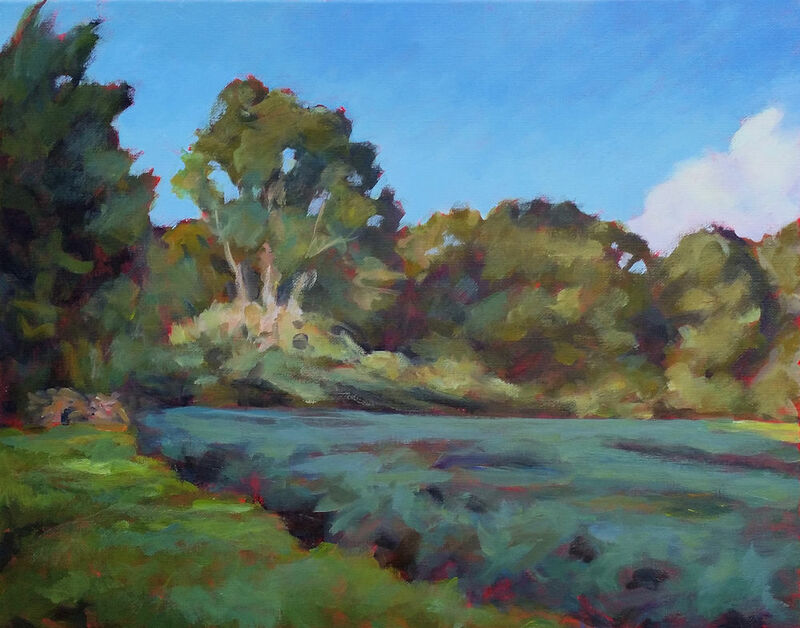 In the first painting, I was sitting in the shade while trying to capture the feel of being tucked away in the mangroves. The photos don’t do justice to the amazing aqua waters but it’s a nice memory. Photo from the location I painted from the Marathon park.